Vegan What??? : "We're gonna eat at a new restaurant, I can't pronounce the name but you're gonna love it..."
"We're gonna eat at a new restaurant, I can't pronounce the name but you're gonna love it..."
Last night we started our girls Thursday night Bible study back up after a month long break. I usually cook for the girls, but things have been a little crazy lately with my schedule and cooking was the last thing I really wanted to do. 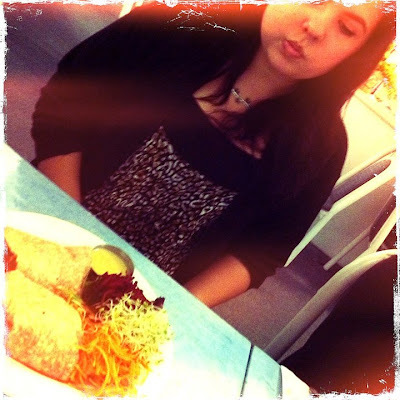 Instead we went to a little Vegetarian restaurant in my neighborhood that I have wanted to try for at least a year. The restaurant is run by Hindu's (or at least I think they are Hindu). 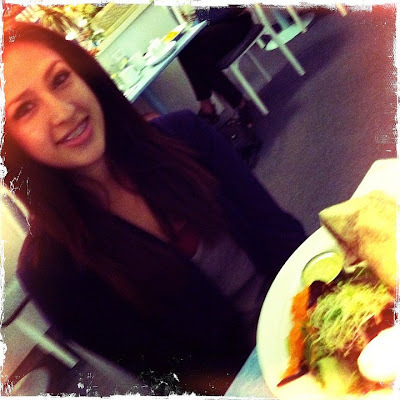 The food was good and I will be going back again. 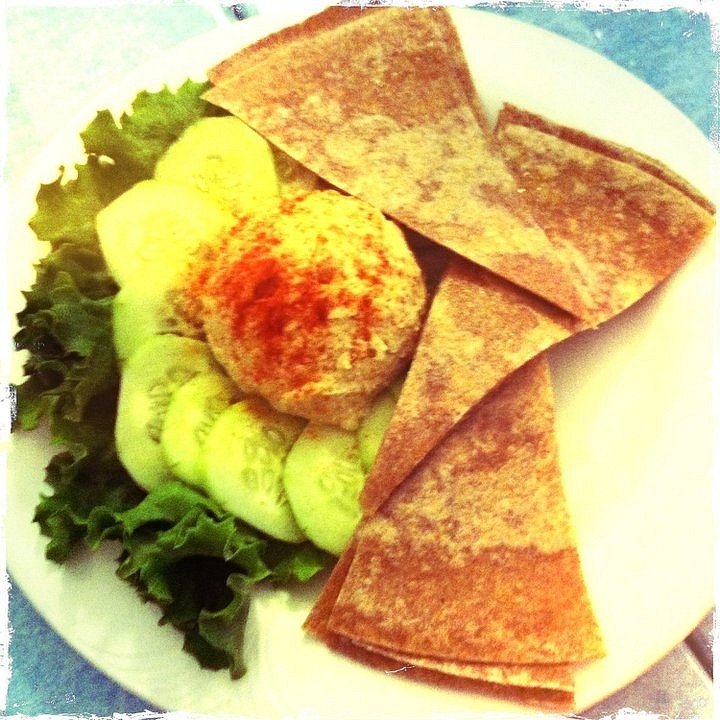 Our fresh homemade hummos on a bed of lettuce served with cucumbers and grilled organic whole-wheat chapati slices. 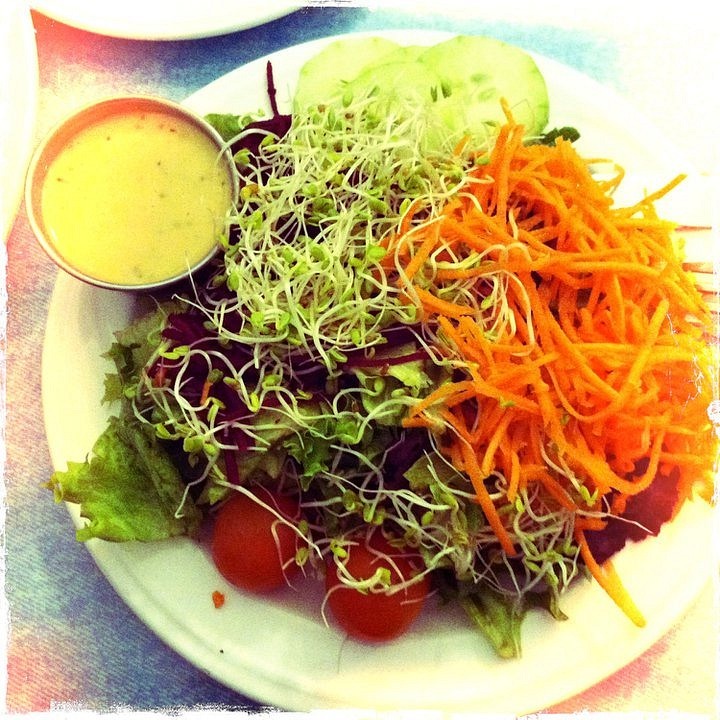 Lettuce, sprouts, tomatoes, carrots, cucumbers, and beets with your choice of salad dressing. My dinner came with a side salad, I got it with the Lemon Tahini dressing. Light and satisfying. 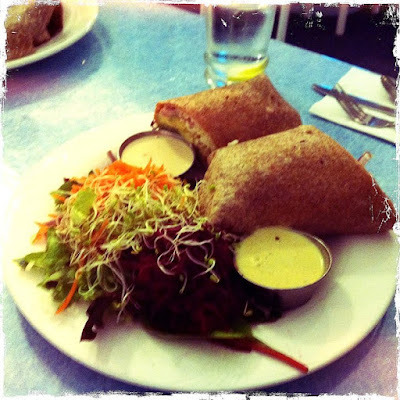 Our Curry of the Day with lettuce, carrots, beets, sprouts and sweet apple chutney sauce. Becca got this menu item, she really liked it and said it tasted great! The ultimate vegetarian burrito: a tasty combination of refried black and pinto beans with jack cheese, brown rice, lettuce, guacamole, salsa, and a side of sour cream. This was Monica's dinner, she loved it...but it did require a knife and fork after it fell apart. It was huge, so if you're hungry this is the item to get. 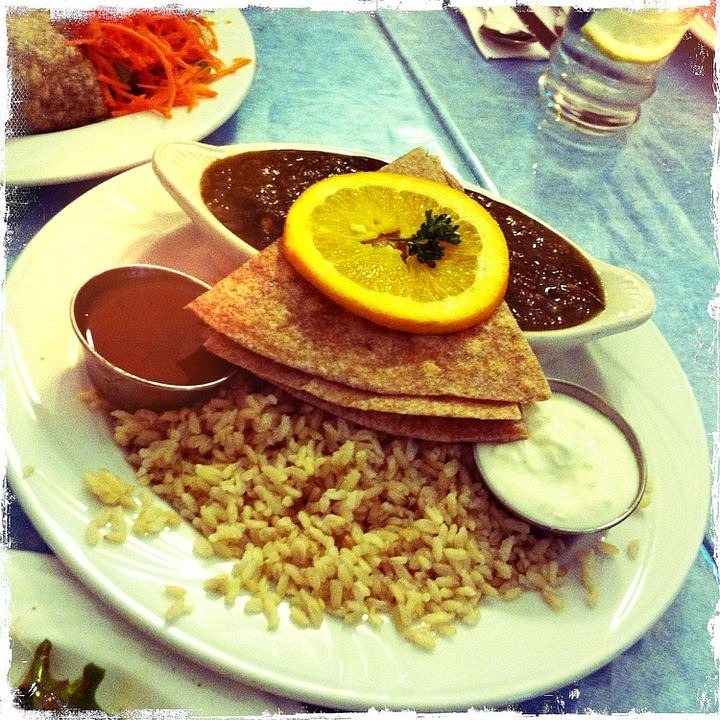 Our "not too spicy" Indian curry of the day with brown rice, raita (yogurt, cucumber and spices), sweet apple chutney and organic whole wheat chapati bread. This was my dinner choice, the curry of the day was Saag "Chicken" Curry. It was really, really good...I would definitely order it again! 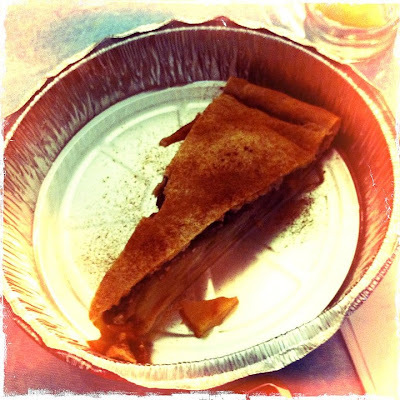 Still the best pie around! Fresh sliced Granny Smith apples with a little brown sugar in a whole wheat crust, baked in an enormous pie pan so the slices are big! I ordered this to go, because I was FULL. I ended up giving it to the girls to give to their mom, she's been sick and I'm pretty sure apple pie cures the flu!! All around we all enjoyed our meal and will go back again. There are a ton more items I want to try. Here is the link for the website, check it out and then go! 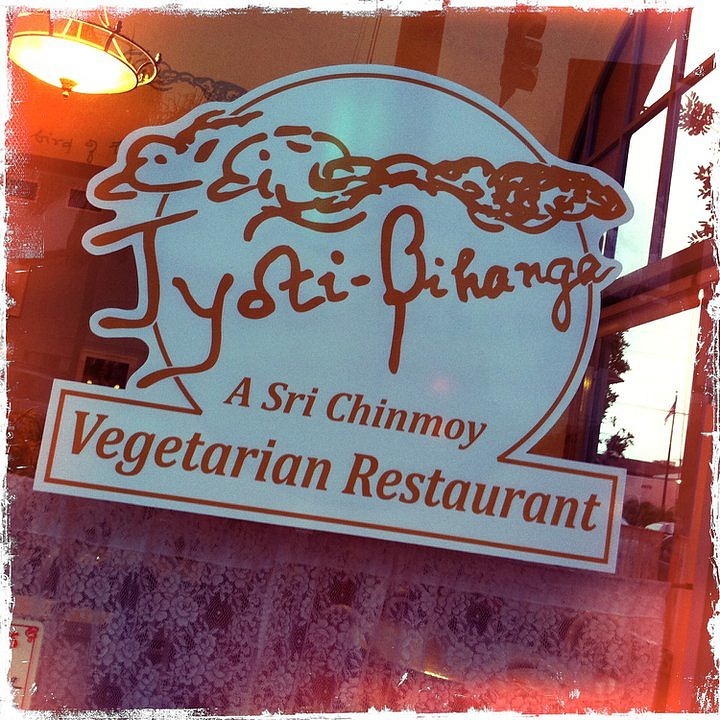 http://www.jyotibihanga.com/index.htm . The menu descriptions come from the menu on the website. Until next week!